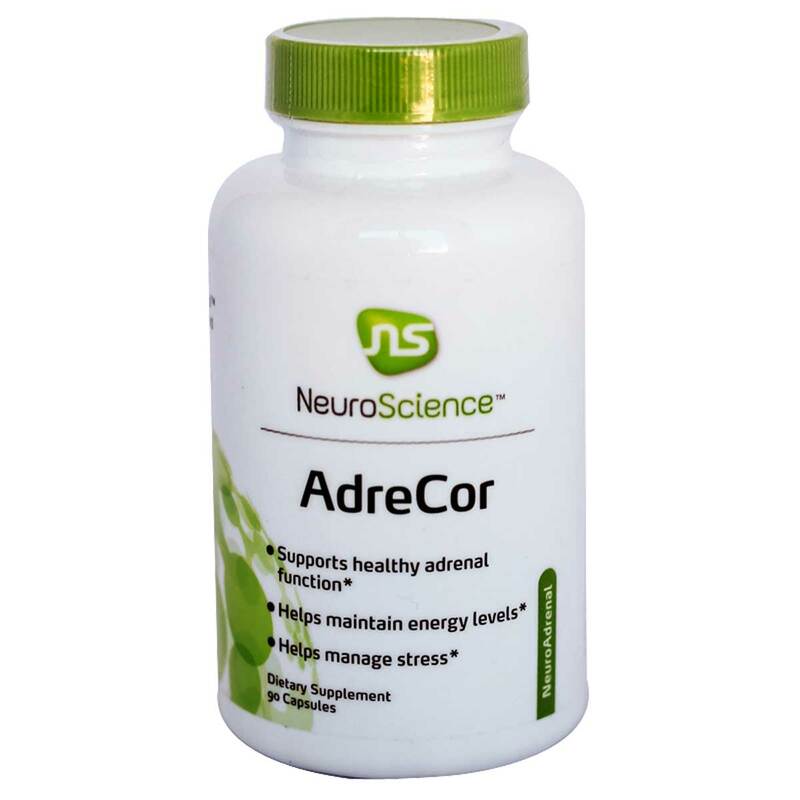 AdreCor combines L-tyrosine and low-dose Rhodiola rosea (standardized to >15% rosavins) to support the synthesis and release of norepinephrine and epinephrine from the adrenal glands. Epinephrine synthesis and the methylation process are supported with L-methionine, 5-MTHF and methylcobalamin. 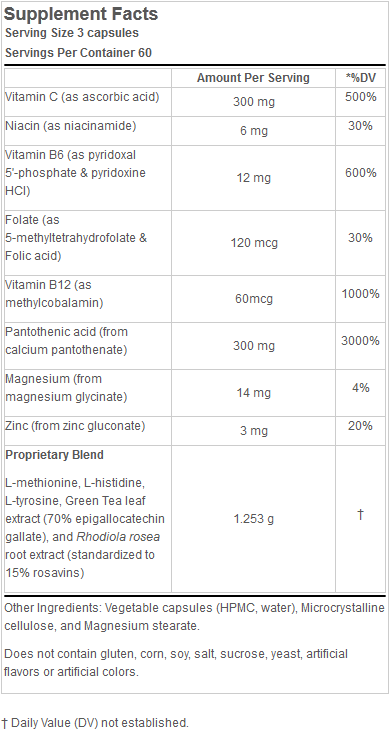 B and C vitamins are included to enhance cortisol production for comprehensive adrenal support. 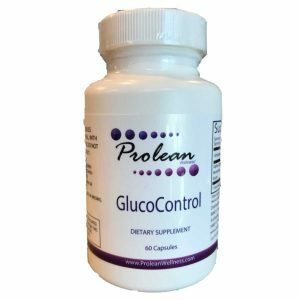 Recommended for patients with fatigue who require comprehensive adrenal neurotransmitter and hormone support. Main Ingredients of Adrecor:Rhodiola rosea extract (standardized to ≥15% rosavins) in low concentrations stimulates norepinephrine and epinephrine release from the adrenal glands N-acetyltyrosine enhances norepinephrine productionL-methionine supports methylation pathways, which facilitate the conversion of norepinephrine to epinephrineEpigallocatechin gallate (EGCG) supports catecholamine levels by blocking the degradative enzyme, COMTVitamins B and C support adrenal gland function, including cortisol production. Use under the supervision of a licensed healthcare practitioner. If you are pregnant or nursing, consult your healthcare practitioner before use. AdreCor is used to promote energy, improve concentration, and reduce fatigue. It is frequently recommended for patients with low levels of epinephrine, norepinephrine, and cortisol. ♦ What are typical dosing recommendations for AdreCor? The maximum recommended daily dose is 10 capsules for an adult, usually dosed twice a day (morning and/or noon). We recommend starting out with a lower dose for patients with anxiety issues. ♦ What can be done if I experience an upset stomach while taking AdreCor? We suggest reducing the dose and/or taking the products with a small amount of non-protein containing food. ♦ Does AdreCor contain adrenal extract? No, AdreCor is a vegetarian product that derives its highly standardized amino acids, minerals, and vitamins from plant-based and mineral sources. It supports the body’s natural ability to create its own neurotransmitters and hormones. ♦ Are there any contraindications associated with AdreCor? Adrecor can be taken in combination with other medications and supplements. Low doses should be used if the patient has anxiety issues or is currently on other medications or supplements that support adrenal function. ♦ Is it safe to take AdreCor while pregnant and/or nursing? Use of amino acids in women who are pregnant or nursing is under the discretion of the consumer and healthcare practitioner. There is no published information regarding the safety or untoward effect of these products or ingredients during pregnancy or while nursing. While the ingredients in the products, as well as the products themselves, have been used successfully during pregnancy and while nursing, this is not proof of their safety. ♦ What can be done if I experience an upset stomach while taking N-acetyltyrosine or L-tyrosine ethyl ester? NeuroScience is committed to delivering personalized health care solutions. 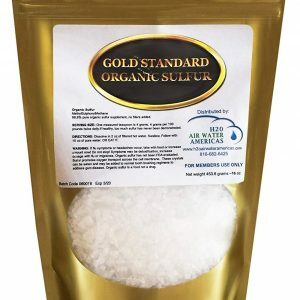 In conjunction with Pharmasan Labs, Inc., a state-of-the-art, CLIA-certified specialty reference laboratory, NeuroScience provide licensed health care providers with both integrative clinical assessments and proprietary nutraceuticals to identify and target neurological and hormonal imbalances. All products made by NeuroScience are of the highest-quality, backed by certificates of analysis, and made in a fully licensed manufacturing facility.